CONTEXT: Scant data exist regarding the overall distribution of dystonia phenotypes in individuals presenting with abnormal posturing to a movement disorder center in India. AIM: To identify the proportion of various types of dystonia presenting to a tertiary care, academic movement disorder center in India. SETTINGS AND DESIGN: We conducted a retrospective chart review of consecutive patients presenting to the movement disorder clinic of our tertiary care, university hospital. SUBJECTS AND METHODS: We included subjects evaluated at least once by a movement disorder specialist and documented to have dystonia (n = 170). Dystonia was classified according to the consensus update on phenomenology and classification of dystonia (Axes 1 and 2). We calculated the proportion of patients classified into one of the defined dystonia syndromes: early-onset isolated generalized dystonia, focal or segmental isolated dystonia with onset in adulthood, combined dystonia, and dystonia associated with other neurological or systemic manifestations. RESULTS: Focal or segmental isolated dystonia with onset in adulthood was the most common phenotype. Among focal dystonias, majority were brachial (65.8%), followed by cranial (27.1%) and cervical (15.7%). Task specificity was documented in 51.2% of focal dystonias, all brachial dystonias. Tremor was present in 70.3%. Etiologically (Axis 2), evidence of neurodegeneration was present in 10.0% and structural lesion in 5.9%. CONCLUSION: Writer’s cramp was the most common isolated dystonia identified in this hospital-based series. Key messages: Focal or segmental isolated dystonia with onset in adulthood was the most common phenotype noted in this hospital-based series from India. Majority of the focal dystonias were brachial and task specific (writer's cramp). Dystonia is a common hyperkinetic movement disorder characterized by abnormal, involuntary, patterned posturing, which is often sustained or repetitive. Worldwide, the prevalence of dystonia is estimated to be 16.4/100,000 of the population making it the second most common movement disorder problem after tremor. Not much is known about the epidemiology of dystonia in India. In a community survey conducted in eastern India, the crude prevalence rate of dystonia was 43.9/100,000 of the population. In this study, writer’s cramp was the most common type of dystonia identified. Cranial dystonias such as blepharospasm and cervical dystonia are the most common types of focal dystonia reported in series from the West and other Asian countries., Hospital-based series may show a different distribution of dystonia as there is a referral bias with the more symptomatic subjects seeking help. It would be useful to know the spectrum of dystonia in hospital-based series as this is likely to represent the symptomatic and health-care-seeking population. Scant data exist regarding the overall distribution of dystonia phenotypes in individuals presenting with abnormal posturing to a movement disorder center in India. We aimed to identify the proportion of various types of dystonias presenting to a tertiary care, academic movement disorder center in India. Such information will help in prioritizing allocation of health-care resources and also in background planning of genotype–phenotype correlation studies. We conducted a retrospective chart review of consecutive patients presenting to the movement disorder clinic of our tertiary care, university hospital. Potentially eligible records were identified by screening the outpatient clinic registers. Patient records meeting all the following criteria were included: (1) symptoms or signs included abnormal, involuntary sustained or repetitive posturing of a body part, (2) clinical information including history and examination available from hospital records, and (3) subjects evaluated at least once by a movement disorder specialist and documented to have dystonia. We excluded patients with Parkinson’s disease as diagnosed by the United Kingdom parkinson’s disease society brain bank criteria and atypical Parkinsonism More Details as defined by clinical criteria. Data were captured from the records using a structured pro forma. We collected information regarding age at onset, duration of illness, distribution of dystonia, additional movement disorder phenotypes, additional neurological/systemic signs, task specificity, diurnal fluctuations, family history, and investigations available. Dystonia was classified according to the consensus update on phenomenology and classification of dystonia. Both Axis 1 and Axis 2 classification schemes were applied. Dystonia was considered familial if at least one other family member in a three-generation pedigree had symptoms suggestive of dystonia, tremor, or parkinsonism. Autosomal-dominant inheritance was presumed when either parent or offspring of the index case was symptomatic. Autosomal-recessive inheritance was presumed when there was skipping of generations or a history of consanguinity in the parents of the index case. The primary outcome variable was the proportion of patients classified into one of the defined dystonia syndromes: early-onset isolated generalized dystonia, focal or segmental isolated dystonia with onset in adulthood, combined dystonia, and dystonia associated with other neurological or systemic manifestations. Secondary outcome variables included proportion of patients with different etiologies (Axis 2). Statistical analysis was carried out by Statistical Package of the Social Sciences (SPSS) software, version 20.0. (IBM Corp.Armonk, NY) 20 (Chicago, IL). Movement disorder clinic register was screened from November 2016 to July 2018, and 205 consecutive records were identified to have documented dystonia. After screening, 34 records were excluded (Parkinson’s disease, 3 and sufficient clinical information not available, 31). Data from 170 patients were included in the final analysis. Mean age of the study population was 38.7±17.0 years and the age at onset was 31±18.1 years. Females constituted 26.5% of the patients. As per Axis 1 definitions of the consensus update, onset of dystonia was in infancy (0–2 years) in 3.5%, childhood (3–12 years) in 12.3%, adolescence (13–20 years) in 14.7%, early adulthood (21–40 years) in 32.9%, and late adulthood (>41 years) in 36.5%. 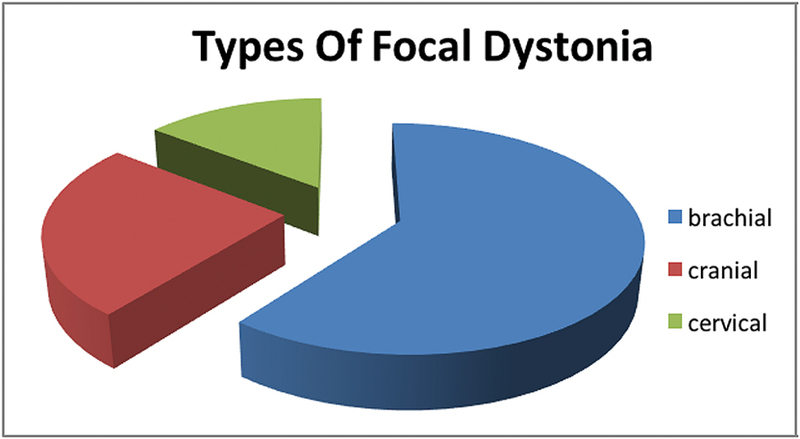 Distribution of dystonia was focal in 48.8%, segmental in 28.2%, multifocal in 14.1%, hemidystonia in 1.2%, and generalized in 7.6%. The temporal course of illness was static in 8.2% and progressive in 91.8%. Action-specific dystonia was noted in 26.4%; among the remaining patients, dystonia was persistent (72.9%) or had diurnal fluctuations (0.6%). Isolated dystonia (no clinical signs other than tremor) was documented in 85.9%. Additional neurological (other than movement disorders) or systemic signs were present in 11.8%. Among patients with isolated dystonia, 22.8% had early onset (<20years). The most common distribution was focal (55.1%), followed by segmental (33.9%), multifocal (7.1%), and generalized (3.93%) [Figure 1]. Tremor was present in 70.3%. Isolated dystonia was familial in 19.5%, with family history consistent with autosomal-dominant inheritance in 13.3% and autosomal-recessive inheritance in 6.3%. 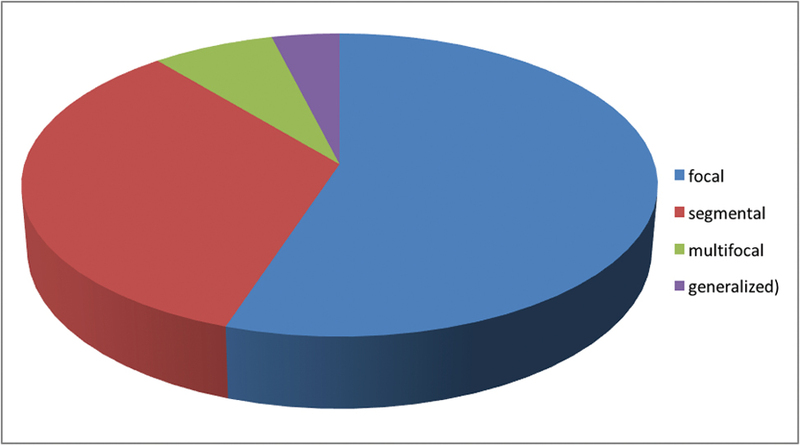 Among focal dystonias, majority were brachial (65.8%), followed by cranial (27.1%) and cervical (15.7%) [Figure 2]. Task specificity was documented in 51.2% of focal dystonias, all brachial dystonia. One patient had dystonia–myoclonus and two had dystonia–parkinsonism. Among patients with generalized dystonia (n = 10), the median age at onset was 10 years (range, 1–47 years). Four patients had early onset, isolated generalized dystonia. Among them, two had onset with cervical dystonia and predominant cervicobrachial involvement, one had onset in the upper limb with later cervical involvement and subsequent generalization and one patient had lower limb onset with later generalization. Two subjects were tested for DYT1, both were negative for GAG deletion. One patient had cranial-onset dystonia, starting in late adulthood (42 years) with rapid generalization over the next 3 years. However, the dystonia remained isolated and no evidence of neurodegeneration or acquired etiologies could be detected as per available records. One subject had lower facial-onset dystonia at 5 years of age, followed by laryngeal involvement and spread to cervical and brachial segments over the next decade. She reported diurnal fluctuations and had a sustained and robust response to levodopa. Etiologically (Axis 2), evidence of neurodegeneration was present on neuroimaging in 17 patients. Evidence of a structural lesion was noted in 10 patients. In 46 patients (15.3%), the etiology was determined to be acquired-perinatal insult (5.3%), infection (0.6%), drug induced (4.1%), vascular (1.8%), brain injury (1.2%), and psychogenic (2.4%). 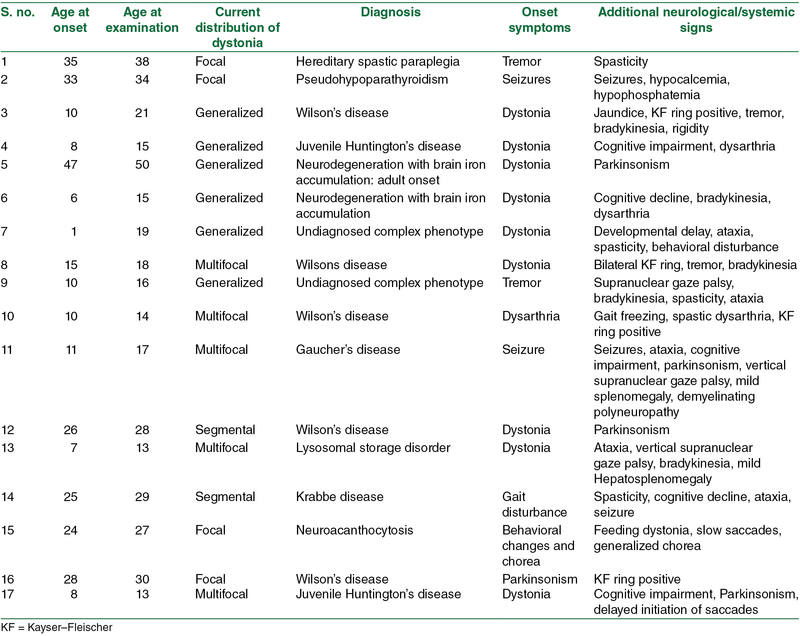 Among the patients with evidence of neurodegeneration and/or additional neurological or systemic signs (n = 17), a definitive etiological diagnosis could be arrived at in 88.2% [Table 1]. These included Wilson’s disease (n = 5), neurodegeneration with brain iron accumulation (n = 2), lysosomal storage disorder (n = 2), juvenile Huntington’s disease (n = 2), neuroacanthocytosis (n = 1), complicated hereditary spastic paraplegia (n = 1), leukodystrophy (n = 1), hypothyroidism with basal ganglia calcification (n = 1), and undiagnosed complex phenotypes (n = 2). Family history was positive in 14.8% of patients with combined dystonia or additional neurological and systemic signs. A previous study from eastern India that clinically characterized patients with primary dystonia found a similar distribution to ours, with writer’s cramp being the most common focal dystonia followed by cervical and cranial dystonia. Other hospital-based series have focused on specific phenotypes of dystonia such as writer’s cramp and dystonic tremor.,, This study attempted to capture the entire spectrum of dystonia including secondary dystonia and complex phenotypes. We used the recent consensus update classification of dystonic syndromes. In this series, more than two-thirds of patients with dystonia had tremor. Other studies have showed prevalence of tremor in primary dystonia of 32%–96%. Our cohort had a large number of patients with focal or segmental cervical and brachial dystonia, which may account for the higher percentage of tremor noted. The limitations of this study include its retrospective nature and small sample size that limits the ability to draw conclusions on various subgroups of dystonia. The validity of family history data in dystonia has also been questioned and in person evaluations may identify false-positive or negative cases. Writer’s cramp was the most common focal dystonia identified in this hospital-based series from India. Majority had tremor in addition to dystonia and approximately one-fifth had a positive family history. These results may be useful to plan recruitment for future studies, especially studies on genetics of dystonia and for prioritizing allocation of health-care resources. This work was funded by DST-SERB Early Career Research Award (ECR/2016/1862). Defazio G, Berardelli A, Hallett M. Do primary adult-onset focal dystonias share aetiological factors? Brain 2007;1: 1183-93. Das SK, Banerjee TK, Biswas A, Roy T, Raut DK, Chaudhuri A, et al. Community survey of primary dystonia in the city of Kolkata, India. Mov Disord 2007;1:2031-6. Dhaenens CM, Krystkowiak P, Douay X, Charpentier P, Bele S, Destée A, et al. Clinical and genetic evaluation in a French population presenting with primary focal dystonia. Mov Disord 2005;1:822-5. Maniak S, Sieberer M, Hagenah J, Klein C, Vieregge P. Focal and segmental primary dystonia in north-western Germany—A clinico-genetic study. Acta Neurol Scand 2003;1:228-32. Lee WW, Jeon BS. Clinical spectrum of dopa-responsive dystonia and related disorders. Curr Neurol Neurosci Rep 2014;1:461. Bressman SB, Sabatti C, Raymond D, de Leon D, Klein C, Kramer PL, et al. The DYT1 phenotype and guidelines for diagnostic testing. Neurology 2000;1:1746-52. Rubio-Agusti I, Pareés I, Kojovic M, Stamelou M, Saifee TA, Charlesworth G, et al. Tremulous cervical dystonia is likely to be familial: Clinical characteristics of a large cohort. Parkinsonism Relat Disord 2013;1:634-8. Naiya T, Biswas A, Neogi R, Datta S, Misra AK, Das SK, et al. Clinical characterization and evaluation of DYT1 gene in Indian primary dystonia patients. Acta Neurol Scand 2006;1:210-5. Das CP, Prabhakar S, Truong D. Clinical profile of various sub-types of writer’s cramp. Parkinsonism Relat Disord 2007;1: 421-4. Jhunjhunwala K, Lenka A, Pal PK. A clinical profile of 125 patients with writer’s cramp. Eur Neurol 2015;1:316-20.